This healthy take on stir fried rice is so simple and requires very little kitchen skill. This quinoa bowl makes a quick dinner, after school snack or lunch. It requires minimal ingredients, cooks in less than 10 minutes and is more nutritious than Chinese take out. 1Heat coconut oil in a large non-stick skillet and add the mushrooms. Sauté the mushrooms until lightly brown. 2While the mushrooms are cooking, combine the ingredients for the sauce in a small bowl. 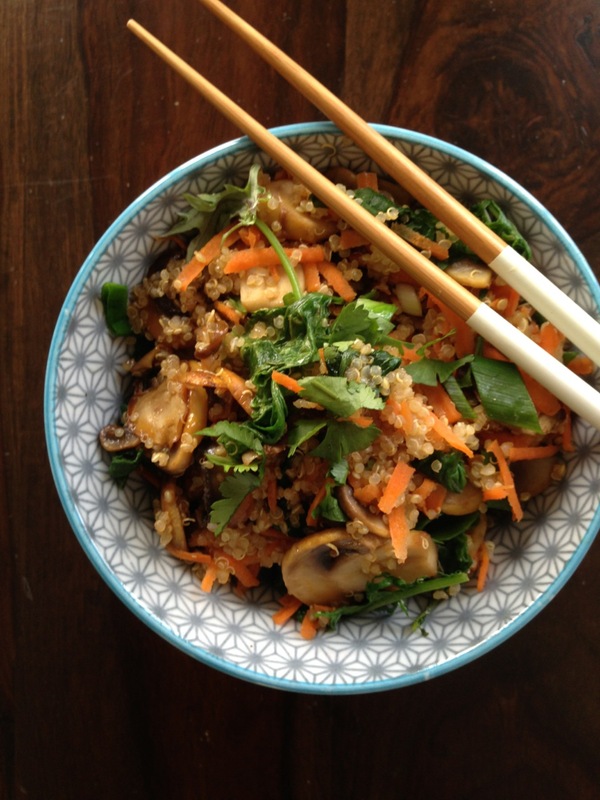 3Add the kale, quinoa, carrot, green onion and sauce to the mushrooms and continue to cook for 2 minutes. Place the fried quinoa in a bowl and top with cilantro. Serve.